Wikipedia has a history of the sarcophagus. 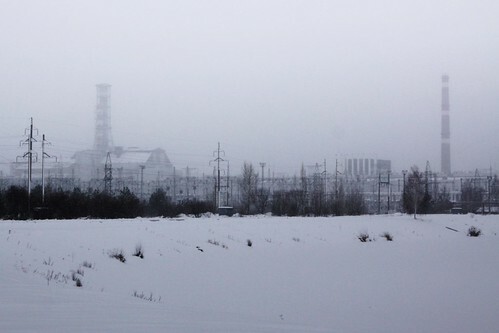 The Chernobyl Nuclear Power Plant sarcophagus or Shelter Object (Ukrainian: Об’єкт “Укриття”) is a massive steel and concrete structure covering the nuclear reactor No. 4 building of the Chernobyl Nuclear Power Plant. The design of the sarcophagus started on May 20, 1986, 24 days after the disaster. Subsequent construction lasted for 206 days, from June to late November of the same year. The Object Shelter was never intended to be a permanent containment structure. On December 22, 1988, Soviet scientists announced that the sarcophagus would only last 20–30 years before requiring restorative maintenance work. In 1998, with the help of the European Bank for Reconstruction and Development, a conservation programme was completed which included securing the roof beams from collapsing. Nonetheless the rain-induced corrosion of supporting beams still threatens the sarcophagus’s integrity. When I visited Chernobyl in 2012 the Object Shelter was still in place, with work well underway on the replacement New Safe Confinement structure. History of the New Safe Confinement. The NSC is designed to contain the radioactive remains of Chernobyl Unit 4 for the next 100 years. It is also intended to allow the present sarcophagus to be dismantled. In 1992, Ukraine’s government held an international competition for proposals to replace the hastily constructed sarcophagus. The study selected a sliding arch proposal as the best solution for further investigations and recommendations, primarily to reduce the chance of the construction workers receiving a harmful dose of radiation. The New Safe Confinement (NSC) was originally intended to be completed in 2005, but the project has suffered lengthy delays. In June 2003 the projected completion date was slated for February 2008. An international tender for NSC design and construction was announced in 2004, with a French consortium named Novarka winning the deal in 2007, with construction commencing in 2010. By 2015 the structure was well underway. November 2016 saw completion of the New Safe Confinement structure, with it being moved into place over the sarcophagus over a fifteen day period. Farewell to the Chernobyl sarcophagus, and onto the next stage of the cleanup process. 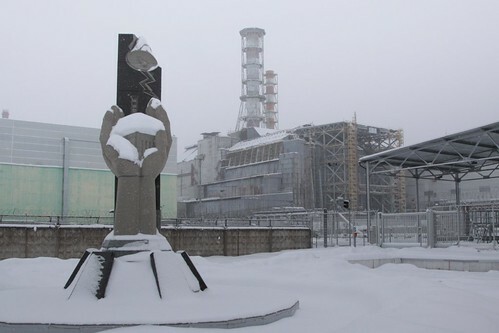 This entry was posted in Tourism and tagged Chernobyl, engineering, Ukraine, urban exploration, winter. Bookmark the permalink.